Most people are surely afraid of dentists. This is caused with the stories from childhood or stereotypes. But ask yourself: what are you really afraid of? Pain? But this fear often comes from ignorance. Nowadays pain is no problem. 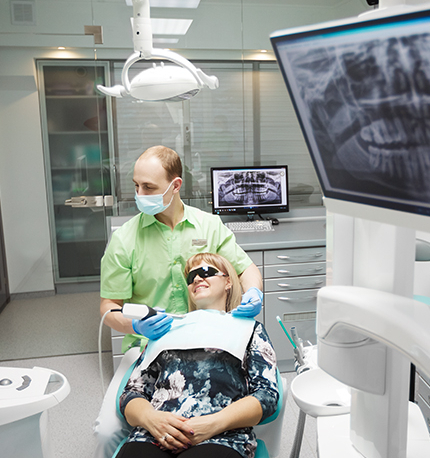 After all, modern dental clinics, particularly in Lviv, offer safe ways of anesthesia for each client. Visiting Rikota Dental Clinic, due to developments in the field of anesthesia, a patient will forget about the pain and tension during the visit. So what types of anesthesia can be offered in dentistry? Local anesthesia can be used when nerve endings in a place of specific intervention become insensitive. Surface and deep sedation are also used, and even anesthesia. Sedation makes the patient half or full asleep, and the use of anesthesia provides complete consciousness lost. All types of anesthesia have their indications for use, because the type of anesthesia is chosen individually for each patient. Rikota dentistry uses a step-be-step method of local anesthesia. First, gums are processed with analgesic gel or spray. And when they become insensitive, an injection is made, with which a patient does not feel any discomfort. Dosage and type of anesthetic are selected individually. This type of anesthesia is most often used in dentistry, as it is well undergone by almost all patients. How strong does anesthesia need to be? Once it was considered that pain just has to be endured. Moreover, most dentists emphasize on the importance of communication with the patient during treatment. Thus, is there any need to use general anesthesia in dentistry when consciousness of a patient is disconnected? In addition, general anesthesia is a complicated procedure for the body of a patient. Therefore, the anesthesia type in dentistry must be appropriate to a specific of the disease. Most often anesthesia is necessary for large or complex dental interventions or the presence of serious mental illness. Over the years of general anesthesia usage in dentistry there were no complications or other unpleasant results of this treatment on condition that the standards are maintained. As dentists do everything necessary to ensure that any treatment is safe and effective for patients’ health.